Like a lot of San Francisco families, my parents have a cabin up at the Russian River. We’d spend all summer there when we were kids until the summer of ’72 when we all got busted raiding the parents’ bottles. Before that though, after our chores, we kids would find our friends and hang out. We’d walk into town and get candy at Lark’s: the berry lollipop, the apple rope gum and even the candy cigarettes. We would hike up the hillsides and build forts. But most of all we would spend our summer days swimming in the river. I took my kids up there a lot too. We could never go swimming until the sun hit the pier. So while we waited, we would go to the park or to Armstrong Woods or even hit up Lark’s like I did as a kid. Sometimes though, we would just hang out in the backyard, and the kids would start digging holes. My kids love to dig holes. What is it with kids – a shovel, a pail and a ton of dirt? I don’t know, but they can be happy for hours playing in the dirt. Sooner or later though, my father would holler from the deck some 25 feet high and tell them to quit digging holes and to fill ’em up. We sadly filled the holes and just waited for the sun to hit the pier. Another time, my kids were in their own backyard in the East Bay, and they started to dig a giant hole. They spent hours and hours digging it real big and played in it like it was a fort. I couldn’t care less, I always enjoyed when they were wholesomely occupied. But their dad showed up and told them to fill the hole and not to dig anymore of them. What a bummer! One day, years ago, my sister, her kids, my kids and I went to Pacifica State Beach in Linda Mar. We grabbed all of the play toys and marched to the shore. What do you think was the first thing the kids did? Yep, they started digging holes. But, unlike the other times, no one told them to stop. Rather, it seemed like God joined them in their play. His laughter roared in the sound of the waves as they played. The waves would playfully fill up their holes. 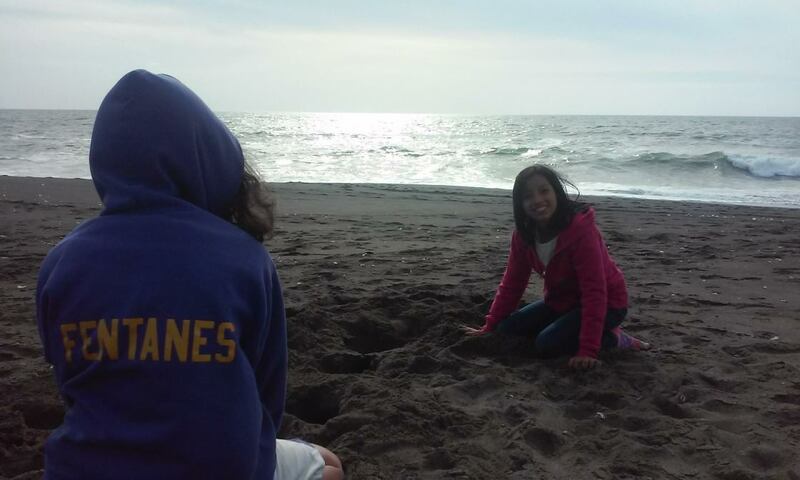 And as the surf retreated, the kids were challenged to dig more holes. And they did! The waves roared back, laughing, playing with the kids. They played all day digging and running away, only to dig and run away again. It was delightful to watch. No one told them not to dig holes; instead it seemed as if God was playing with them. He didn’t mind them digging holes in his backyard.